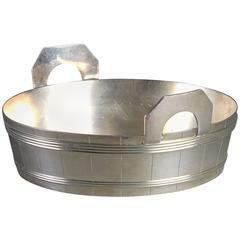 This is a gorgeous antique English Victorian silver plated roll over butter dish, circa 1870 in date. 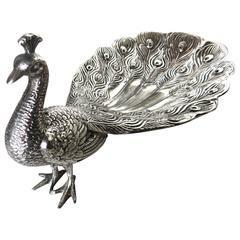 With superb engraved and cast decoration the underside bearing the embossed label "Patent Hemispherical" It has a rermovable pierced inner liner so that you can place ice below it to keep the butter cool. Add a touch of class to your next dining experience. Condition: In excellent condition - please see photos for confirmation of condition. Dimensions in cm: Height 12 x width 20 x depth 14 Dimensions in inches: Height 4.7 x width 7.9 x depth 5.5. 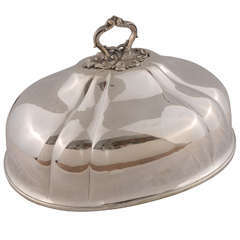 An early 20th century silver plated butter dish in the form of a coopered pale with carrying handles. Having makers marks to the underside. Large 19th century English silver plated meat dome.